Every log home construction timeline is different depending on the contractor, weather and region, but an overview of the process can help you plan. Every log home construction timeline is different depending on the contractor, weather and region, but an overview of the process can help you plan out when the first shovel hits the dirt to when you’re finally moving in to your dream home. 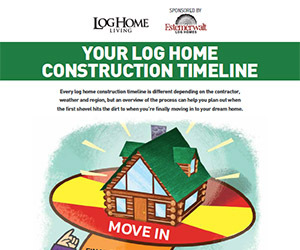 Fill out the form below to download "Your Log Home Construction Timeline." This article is sponsored by Estemerwalt Log Homes.